Since I am in a nostalgic mood let me post a story I wrote 9 years ago called CYCLE TOWN PUNE – harking back to memories of the 1960’s and 1970’s when Pune was known as the Cycle Capital of India. In theory – it is possible to ride a bicycle even today in the city of Pune – especially on BRTS Roads – which have dedicated “Cycle Tracks”. But – in practice – it is not feasible to commute on cycles in Pune – since the cycle tracks are encroached upon/damaged and are unfit for cycling (even the pedestrian lanes are encroached and are unfit for walking). Of course – cycling on roads had become dangerous due to the heavy and chaotic traffic. But – this was not so in the Pune of Yesteryear – when – the bicycle was the primary mode of transportation in Pune. We enjoyed cycling all over Pune City and Camp. Pune was indeed a “Cycle Town”. Let me share some memories of those carefree days of cycling. I am sure you will enjoy these reminiscences – and maybe – this will tempt you to hark back to your good old days and memories of your hometown too. Please do let me know if you liked this article and comment – I look forward to your feedback. When I was a small boy (in the 1960’s) – and later in the 1970’s – we used to cycle all over Pune. In the 1960’s – Poona (as Pune was called then) – was known as the “Cycle Capital” of India – since Pune had the maximum number of cycles. But – with the advent and proliferation of scooters – this honour of “Cycle Capital” was taken over by Delhi – and Pune became the “Scooter Capital” of India. Those days 90% of the vehicles on the roads were Bicycles. A few Scooters could be seen zipping by – and occasionally – an Ambassador or Fiat Car would appear on the roads. Auto-rickshaws were beginning to make their appearance – and the PMT Bus was the second-most popular mode of transportation after the bicycle. If you do not believe me – you just watch the scene from the iconic Hindi Movie Sangam (1964) – where Raj Kapoor can be seen merrily cycling down Jangli Maharaj (JM) Road Pune (then known as “80 Feet Road” – the widest road in Pune those days). As I said – in those days – Pune was a “cycle town”. You just picked up your bicycle – and you went wherever you wanted to. Today – I dare not try to cycle on the roads of Pune – unless I want to land up in a hospital with my bones broken – or worse still – in the morgue – with my body crushed to pulp. There is just no place for the poor cyclist to cycle in the murderous traffic of Pune. In fact – in Pune – the only place you can cycle are on the cycle-lanes on those small stretches of the BRTS routes – which thankfully have still not been encroached upon (of course – even here – you risk being knocked down by a motorcyclist) – or you can pedal away on those obscure cycle-tracks which take you nowhere. Nowadays – for most young Punekars – cycling is a hobby – a sport – a recreation – a “passion” – or – an “environment friendly” thing to do. Those days – in the 1960’s and 1970’s – cycling was the primary means of transportation. That’s why today you have all types of fancy bikes (which cost the roof) – and snobbish people want to show off their cycles as “status symbols” whenever they get off their expensive limousines and take a rare bike ride wearing funny outfits and contraptions like gloves, helmets et al. There are Terrain Bikes, Sports Bikes, BMX Bikes, Racing Bikes – all sorts of hybrid combinations – which look good – but are most uncomfortable to ride. Since I was used to normal cycles (Roadsters) – I found the MTB uncomfortable to ride. And – after the ride –I got such a pain in my “you-know-where” – that I thought I had got Hernia. In my younger days – it was not “Snob Appeal” – but it was “Utility Value” that governed the Design of Bicycles. The predominant cycle those days was the “Roadster” (in bicycle parlance). The Roadster was a utility bicycle designed for practical transportation – unlike the fancy bikes of today which are primarily designed for recreation and for showing-off. The “Roadster” Bicycle was designed for “Occupational Commuting” – and it was designed to give you a comfortable ride. As I said earlier – those days – you did not ride a bike to burn calories. A cycle was the primary means of transportation – and you commuted from one place to another on a cycle. Of course – fitness was a by-product. In my college days – I used to cycle about 20 Kilometres every day – breathing fresh unpolluted air – and this was healthy exercise. We cycled in our normal clothes – and not in “biking wear” – and that’s why the Roadster Design Bicycle had proper mudguards and chain guards to keep it clean. In addition to comfort – the qualities we looked for in a cycle were sturdiness, durability and endurance. A cycle was a permanent long term acquisition – not a “use and throw” item. Well – if you go to Bicycle Shop today – you may not find the humble “Roadster” displayed along with those fancy fashionable bikes. In fact – there is a proliferation of high-falutin Cycle Malls in Pune selling all sorts of fancy and expensive bicycles. But if you look on the roads – you will see that the redoubtable Roadster is still going strong. And – if you care to go to the mofussil – you will see that this humble Roadster Cycle is still the predominant mode of transportation. And – if you go to those good old cycle marts in Budhwar Peth in Pune – you will see that these unpretentious Roadster bikes are still selling in plenty. When we were children – there were no “kiddie” or “children’s” bikes to pamper us. We learnt how to cycle the hard way on the hardy Adult Roadster Bikes – which entailed many falls and bruises – including one on my forehead – the scar of which is prominently visible even today. 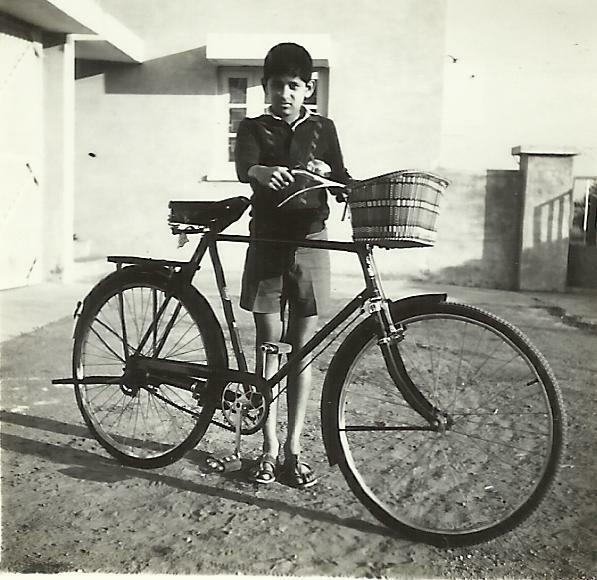 I learnt how to cycle when I was 7 years old – but I got my first cycle in 1968 – on my 12th Birthday. Until then – I used to hire a bike on an hourly basis from one of the many “Cycle Marts” that adorned almost every street corner of Pune – or manage a ride my uncle’s cycle whenever he was not using it. The moment it was announced that I would be getting a bike as a birthday gift – I was very excited. My friends and I started our market survey. Which cycle did I want…? There were so many brands to choose from. At the top end was the matchless Humber – the prized crème de la crème brand from Raleigh Cycles. The Humber Men’s Roadster had a unique double-fork – a duplex fork design which had two tubes for absorbing shocks better – and a frictionless chain for a smooth ride. Owing to all these refinements – the Humber Cycle gave you the ultimate in riding comfort. Now my Dad had given me a budget of Rs. 200 – and the Humber which cost around 400 bucks was out of the question – as were other premium brands of cycles like Raleigh, Rudge, Buke and BSA. So – I had to choose from Hercules, Phillips, Hind Superb, Hero, Eastern Star, Avon or Atlas – which were the popular bicycle brands those days. At first – I wanted to buy a Phillips Cycle which looked very handsome. But the dealer insisted that I try the latest model of Atlas (which he claimed was sturdy and comfortable – and it had the best bearings – and the cycle was long lasting, economical and ideal for a student like me). So I took a “test ride” – and I acquired an Atlas Cycle for the princely sum of One Hundred and Eighty Rupees (yes – Rs. 180 only). I fitted my bike with a dynamo and light (for night riding) – a bell – a carrier – and a sleek stand – and a basket. As I rode my brand new shining black Atlas cycle – I felt on top of the world. This Atlas Cycle rendered yeoman’s service (I told you that I said I cycled about 20 kilometers every day) – and my bicycle accompanied me all over on my cycling trips – including one touring UP and Bihar – where we just carried our cycles in the second class train compartment – and we got down wherever we wanted – and cycled away for our sightseeing – and caught a train again at the nearest station. No one dared to ask any questions – because we were “students”. (I was happy to see that this redoubtable bike was fully operational when I last saw it in the year 1998 – when the cycle was 30 years old). Soon – I bought a brand new Hero Roadster Cycle for around three hundred bucks (Rs. 300 only) – which I used for cycling all around town – whenever I came to Pune on my weekend trips or holidays from Mumbai – where my ship was based. Though I had acquired a scooter by then – which I used for “family” outings – I still rode my bike for my solitary travels in Pune. Alas – my newly acquired wife refused to ride “double-seat” with me on my cycle – à la Dev Anand and Mumtaz in the movie Tere Mere Sapne – though my wife had been an avid cyclist and she rode a Ladies Cycle herself in college. By the way – riding double-seat – and without a light at night – were traffic offences. If a cop caught you without a light at night – or riding double-seat on your bike – he would deflate your tyres as punishment – and you would have to walk all the way dragging your cycle along. For parking your cycle – there was cycle-stands all over – in cinemas – at railway stations – in parks – everywhere. Till the 1980’s – in Pune – the bicycle was still the most popular mode of transportation – since – in Pune – distances were not that much – and – the traffic was not that heavy. But gradually – scooters were slowly taking over – as people were increasingly in a hurry to get wherever they wanted to go. I quit cycling in Pune sometime in the end 1980’s – because cycling had become increasingly unsafe. The traffic situation in Pune had become quite bad. Heavy vehicles, buses, cars and scooters ruled the roost. And after a few close shaves in the dangerous traffic – I decided to stop cycling on the streets of Pune. Cycling also keeps you stress-free. Those days – as I cycled to college or work – the physical effort while cycling helped remove my stress – unlike driving a car or scooter in the chaotic traffic of Pune – which drives you crazy. Almost everyone cycled to school and college – and – to work and back – all the way from the heart of Pune City – even to far-off places like the factories in Khadki and beyond. Cycling was a healthy affordable way of commuting. Yes – cycling was primarily a means of travel – and not a competitive sport or a means of working out for exercise as it is now. Of course – exercise was a byproduct of cycling. I have decided to relive those good old days. So I am going to get myself a cycle – not a fancy bike – but an a old-style standard roadster bike – maybe I will try out the good old tried and tested Hercules Roadster Cycle this time. The only problem is that I will have to find a safe road to cycle on – which is nigh impossible in Pune – or a Cycle Track on the side of a BRTS Road. I eagerly await the removal of encroachments on the Cycle Tracks on the BRTS in Wakad – so all of us can cycle down the bicycle track – as people do on the BRTS route on Satara Road near Padmavati/Bibwewadi. In the mornings and in the evenings – I watch the serpentine traffic moving at snail’s pace on the Wakad Hinjewadi Road. I wonder how different things would have been if everyone rode bicycles to work like in yesteryear Pune. We would have a more healthy, unpolluted and stress-free Pune.